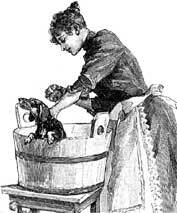 Four Paws & Co. now offers a self-serve dog wash. Six bathing stalls and three tub heights provide comfort for every dog. Each private stall is stocked with towels, shampoos, conditioners, and all of the basic grooming equipment. Best of all, when you are done bathing your dog, we clean up the mess! Come in soon and help your dog clean up his act!